QA Higher Education is one of a group of businesses which combine to make QA Ltd.
QA is well regarded for providing industry leading IT and Project Management training. QA works with some of the country’s largest organisations offering training that delivers long-lasting and improved performance. In total, QA works with 6,000 clients including 80% of the FTSE 250. As a business, QA is decorated with a wide range of industry awards and recognitions. Often the awards QA win are highly competitive, contested by a number of different training providers from across the world. QA Apprenticeships provide IT, tech and business apprenticeships. The first IT apprenticeships business to be graded Ofsted ‘Outstanding’, their apprenticeship programmes were described as “world-class”. QA’s programmes blend high-quality training with real-world experience in the workplace, and are designed to upskill local talent with training relevant to their job roles. Their wide range of programmes include industry-recognised qualifications and accreditations from City & Guilds, Microsoft, CompTIA, ACA and the APM. 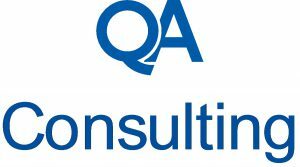 QA Consulting provides consulting services to a wide range of large organisations and government departments. Since its acquisition of the NETbuilder Academy in 2015, QA Consulting is also able to recruit and train experts in a wide range of technologies.